Project obstacles and solutions: In an effort to reduce the amount of dust during road repairs, the Indiana Dept of Transportation recently designated a new specification for aggregates used in chip and seal applications. SC-16 greatly reduces the ratio of fine aggregates in chip and seal mixes. Dust can cause low visibility for motorist traveling through a construction zone and a safety issue for both drivers and road crews. Without the fine aggregates, blowing dust was all but eliminated. 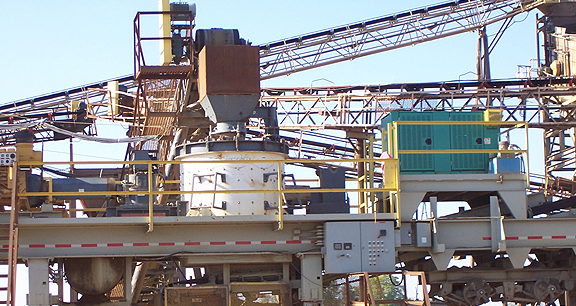 SC-16 also reduces the amount of loose, coarse aggregates that can become airborne and become a safety risk. Without the presence of oil-absorbing fine aggregates, the larger stone is more thoroughly coated and sticks to the mix better. IMI worked closely with the LaPorte INDOT District Office to deliver a product that met the SC-16 specs. IMI's Kewanna plant used a vertical shaft impact crusher to produce INDOT approved gravel for the Rochester and Winamac area road repairs.